Ronald Clarence Southerton attended Bemrose from 1936 to 1943 when the headmaster was William A McFarlane. 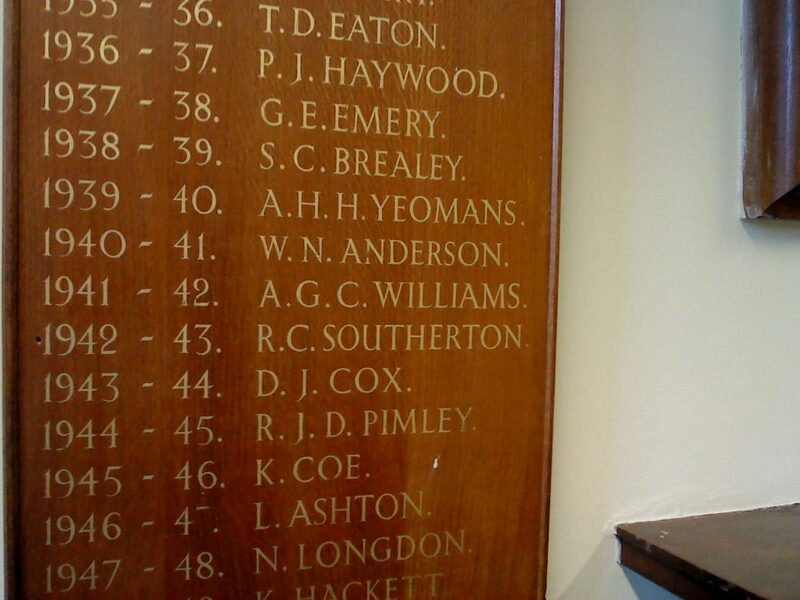 He was school captain in 1942-43 and as such his name is displayed today on the old oak captains board in the Library. After leaving Bemrose he attended the Derby Technical College at the top of Green Lane to undertake a wartime Engineering Cadet course. He achieved membership of a learned institution (IMechE) and a successful career in the Regular Army followed where he rose to the rank of Major in the REME. His academic status rose to the level of Chartered Engineer. The many places in which he served include Egypt, Palestine (1948), Libya, Korea (1951) and Aden (1957-58). After leaving the army in 1959 he followed a varied career in the diesel engine and gas turbine industries, including a few years residence in both Iraq and Sweden. In later years he became a translator of technical Swedish. Ronald’s older brother Thomas Henry Southerton, now deceased, was a founder member of Bemrose School when it opened in 1930. Ronald currently lives in Scarborough with his wife Betty, whom he married in the summer of 1949. He has written a short autobiography titled “All over the place!” which was published in 2013. Philip Johnson attended Bemrose from 1945 to 1950. He began his working life as a Technical Officer with the with the British Rail Research Department (Metallurgical Department). Through day release study he gained an Hons Degree in Maths with Statistics and Physics with London Imperial University and joined a newly established Non Destructive Testing Section within the Research Department. He continued to work for British Rail and led a team that provided a service of radiography, ultrasonics and other methods of defect detection in the industry. In 1969 he moved to London to join the Director of Civil Engineering to control and operate a new Ultrasonic Test Train for rail defect detection. As Track Assessment Engineer Philip’s responsibility increased to include control of track geometry measurement, structure gauging and on-track rail grinding until his retirement in 1993. In retirement he has been the Chair of the Derby Patient and Public Involvement Forum and has spent 3 years as a governor of the Royal Derby Hospital. In May 2014 Philip returned to visit Bemrose for the first time since leaving in 1950.
d) Keith developed and led the University of London Inner City Schools initiative to encourage pupils from lower socio-economic backgrounds to aspire towards and gain university places on degree courses. Upon retirement Keith became an Emeritus Reader at the University of London. Richard Parkes attended Bemrose when he passed his 13+ examination at Rykneld School and joined 3T here in September 1961. He left in July 1965 with 7 GCE “O” levels including his favourite subjects English and Physics. Richard is very appreciative of the teachers at Bemrose, particularly his Physics teacher Mr Grimadell. After Bemrose Richard worked at Williams Deacons Bank in Derby Market Place (now RBS) but left after two and a half years to enter the fledgling computer industry where he remained in one capacity or another for the rest of his working life, his final 20 years being served in the Atomic Weapons Establishment at Aldermaston. During his career he gained a HNC in Computer Studies at Reading College of Technology in 1976. Stephen Hughes attended Bemrose from 1963 to 1966. He is a retired school teacher and business owner of www.simplynicetours.com , a travel company that brings American tourists to England and Wales. He transferred to Bemrose from Littleover Secondary Modern School at the age of 13. He continued his education at High Peak College (Buxton), Trent Polytechnic (Nottingham), Lock Haven University (Pennsylvania, USA) and finally Shippensburg University (Pennsylvania, USA) where he gained a Master’s Degree in Learning Disabilities. He now lives in Carlisle, Pennsylvania, USA and would welcome contact from fellow Alum. John Kenny attended Bemrose from 1968 to 1974. He went on to obtain a Degree in Maths at Oriel College, Oxford University. Since 1984 he has lived in London and is married with a daughter. He is a Chartered Accountant working for the government and manages a team that funds the schools building programmes in England. Robert Matthews attended Bemrose from 1971 to 1978. After leaving Bemrose he read Physics at Corpus Christi College, Oxford University, where he graduated in 1981. He is currently Visiting Reader in Science at the Department of Information Engineering, Aston University, Birmingham. He is also a distinguished science journalist, currently anchorman for the science magazine BBC Focus and freelance columnist for the Financial Times. In the past he has been the science correspondent for The Sunday Telegraph, technology correspondent for The Times, and a freelance contributor to The Economist. In 2000 he was awarded Feature Writer of the Year by the Association of British Science Writers. Robert is also the author of two successful popular science books, 25 Big Ideas in Science (2005) and Q & A: Cosmic Conundrums and Everyday Mysteries of Science (2005). Robert is a Fellow of the Royal Statistical Society, a Chartered Physicist, a member of the Institute of Physics, and a Fellow of the Royal Astronomical Society. Aleksandra Kinay (Nee Damjanovic) attended Bemrose from 1975 to 1982. Aleksandra was the first Head Girl of the school 1981-1982. After leaving Bemrose she attended Queen Elizabeth College (Now part of Kings College, London), Open University and University of Sheffield, obtaining a MSc in statistics. She now works as a Key Account Manager (Medical Devices/Pharmaceuticals). Sarah McSeveney (Nee Willgoose) attended Bemrose from 1995 to 2000. After leaving she attended Burton College and Derby University where she gained a BA Honours Degree. She is now an administrator for a company called Assystem, who are contractors to Rolls Royce. Naela Habib attended Bemrose from 1999 to 2006. After leaving Bemrose she attended Joseph Wright College, Burton and South Derbyshire College and University of Derby. She gained a BA (Hons) in Educational Studies and is now working at Pear Tree Infants School where she is in the process of applying for her teacher training in Primary Education. Zak Sum Hing Lam attended Bemrose from 2003 to 2008. After leaving Bemrose he attended Landau Forte 6th form and then the University of Nottingham where he gained a BSc 1st Class Honours Degree in Mathematics. Zak is now a graduate analyst at Experian plc. Carl Anderson attended Bemrose from 2010 to 2015. After leaving Bemrose he attended Derby college and is now the President at Derby College Students Union.